I went to buy pot lights on sale at Rona the other day and browsed the flooring department just in case I could find something like we've been looking for. We've done quite a bit of research and have been trying to narrow down our flooring choice for a little while now, factoring in price, durability (2 dogs and a kiddo on the way will certainly put lots of wear and tear on it), and color. 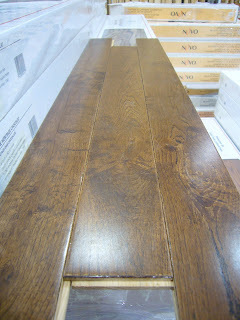 I came across a beautiful solid oak hardwood for only $3.39/square foot! It just so happened that Rona was having a 15% off any item sale on today. Woot, woot! So, in the end we got it for $2.54/sq ft (pre tax). If you're doing the math, you realize somehow we got a more amazing deal than what 15% would get us. Not sure how that happened, but I'm not complaining. Our entire upstairs minus the bathroom will be covered in beautiful solid oak hardwood for cheaper than it would have been to do laminate. Craziness! It isn't click flooring like we had been looking at, but either nailing or glueing it down wont add a significant amount of money to the final project. It will result in a bit more work, but my strongbad hubs doesn't mind a little hard work! 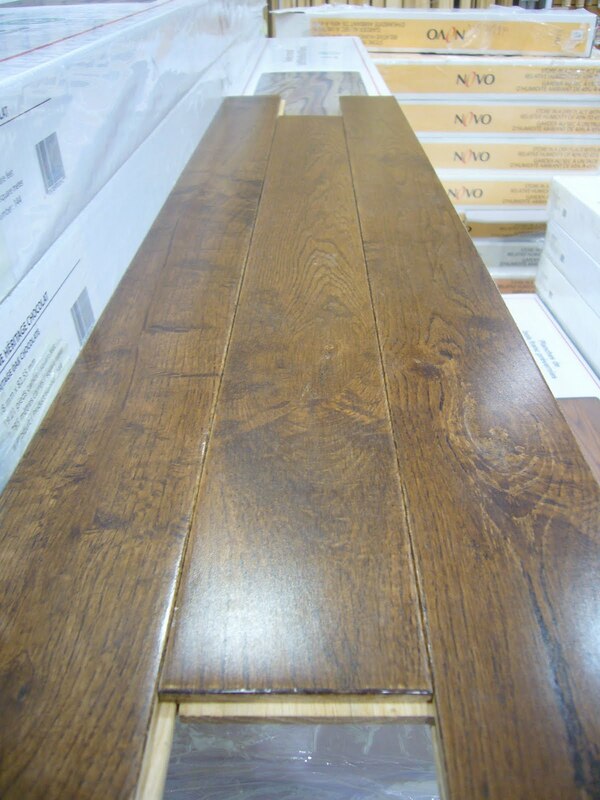 The next shipment doesn't come in until the end of the month, so we'll have to wait a bit longer to actually pick up our pretty chocolate colored flooring. Good thing because there are lots of things that need to happen before the flooring goes in. Even getting it at the end of the month we'll still have plenty of time for it to sit in the house for a month or so and acclimate to the climate before installing. Hooray for the biggest expense being out of the way for renos!